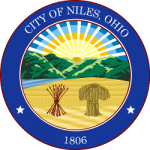 The city of Niles, located in the heart of the Northeastern Ohio industrial area, is centrally located between the cities of Cleveland, Ohio, and Pittsburgh, Pennsylvania, each less than 70 miles away, and Akron and Canton, Ohio, each about 1 hour away. This prime location with access to the major interstate highways of 11, 76, 80, and the Ohio Turnpike is a major draw for businesses and industries who want to take advantage of our lower cost of living, and yet be close major cities of commerce. Niles is also only 15 minutes from the Youngstown/Warren Regional Airport with its Free Trade Zone, in addition to being approximately an hour from the Cleveland, Akron/Canton, and Pittsburgh, Pennsylvania airports. Rail transportation is also readily available. Niles is not only a prime place for industry and commerce and industry, but also for recreation. Although, Niles has its own minor league baseball team, it is close to both sports arenas/stadiums in Cleveland and Pittsburgh, which carry professional teams in football, baseball, basketball, and hockey. There are dozens of top notch golf courses scattered throughout the area. All within a short drive are several major amusement and water parks such as Cedar Point, museums, state parks, and theaters.